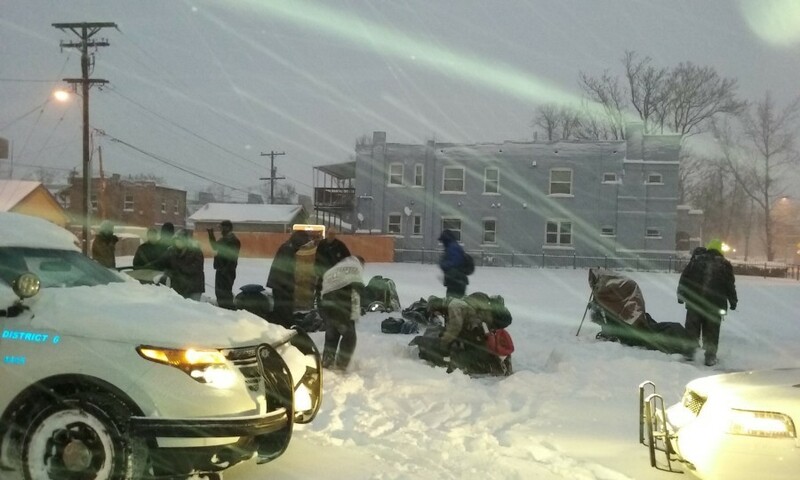 Denver, CO – In the early morning of December 15th, Denver police forced dozens of homeless community members of Resurrection Village into blizzard conditions. Since their tiny homes action on Oct. 24th, Resurrection Village members have been sleeping near various unused empty lots owned by the Denver Housing Authority and had set up tents the night before to provide temporary shelter from the impending snowstorm. Unicorn Riot was at the scene of the newly fashioned tent city and documented Denver Police threatening everyone with arrest if they did not dismantle their camp. Police arrived around 6am in the midst of hard snowfall and brutal winds while everyone was warm, dry and sleeping. DPD then ordered the community to dismantle their tents and disperse. Denver Police’s response on twitter was to tweet about their homeless outreach and goal of getting everyone out of the cold. Specifics on Denver’s unethical Urban Camping Ban are described in the video below by a member of Denver Homeless Outloud who conducted a city wide survey of Denver’s houseless population in 2013.